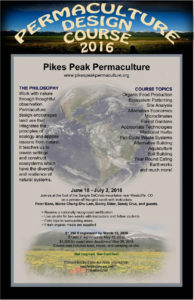 Southwest Institute for Resilience 7th Annual PDC: Permadynamics! A marriage of permaculture, biodynamics with a splash of holistic management. New tools in the toolbox for a resilient future. When: July 31st through August 13th, 2016. Residential class with camping space and food provided as well. Instruction from Kris Holstrom, Wind Clearwater and Pat Frazier (with perhaps some special guests). 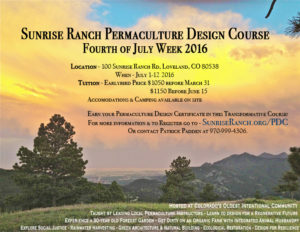 Where: One week in the North Fork Valley atPeace and Plenty Farm and one week at Tomten Farm near Telluride. Cost: $1300 with $100 off if registered by June 1st. 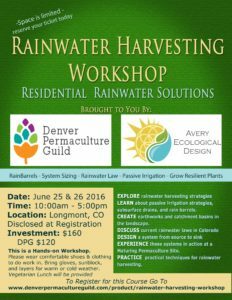 Contact swpermaculture@gmail.com for more info and to sign up!